Lip labret jewelries in gold are the thing in the market these days. Since these are the precious gold metal that is anti-corrosive and last long. It is also a material that is hypo allergic. Gold jewelry labrets are of 14K gold. 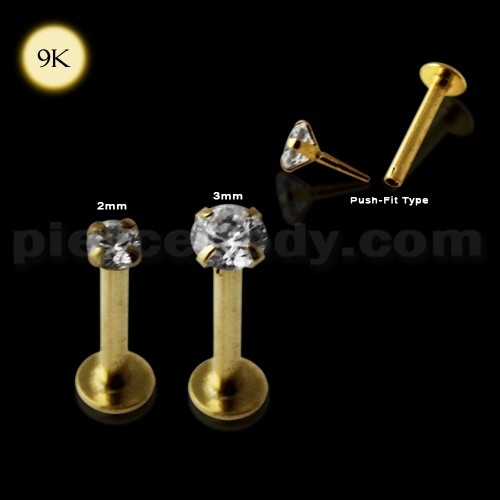 They come in bars from various lengths of gold labret jewelries. Different kinds of labret jewelries are available in various designs- either as simple barbell endings or endings having intricate designs. The jeweled ends often to have an embellishment with precious stones in white and in different colors. The stones are available in sizes starting from 2mm. The other top gold labret jewelry designs include heart and star among many other designs. Gold Labret jewelry are created with ball top endings or jeweled ending. The jeweled endings come in different varieties and with, or colored stones adore these jeweled endings. The ball stops come in balls of various sizes while the designs vary from, square, round, heart, star, rectangle and much more. These are extremely cost effective and affordable too. With all the latest designs and innovations of gold labret jewelry, it’s the designs in gold that has all Labrets lovers going crazy. Not only are they made from either 9K or 14K gold, but are crafted to perfection to meet all your needs. Let your lips do the talking and impress your friends at the same time. Choose from the exciting array of 9K and 14K ones made out of gold labrets and have a blast. You are welcome to check out the remarkable collection of lower lip jewelry in gold from piercebody.com as well especially when you do not want to wear the same old boring shapes like squares and triangles. You can certainly go for a bejeweled labret though, but better are the hearts or stars that dangle from your lips instead and keep your skin safe from infections by opting for the bio plast or bio flex range.